Pretend you're in a large auditorium, about to catch a live Q&A session with your favorite author. Situated far from the stage, you realize that the audio system is muffled, and you're unable to understand what is said on the stage—it's an unfortunate and frustrating occurrence, and a driving force behind why integrators work hard to provide clear, crisp audio in every project, to ensure the experience is not lost. This year, top audio brands were installed across a variety of venues, from sports arenas, to classrooms, to theme parks. As part of the annual audio issue, SCN set out to get a closer look at these projects; we've compiled a short snapshot of some of the top installs from this year. Spellcaster Productions of Hammonton, NJ designed and installed the new audio system for New Jersey’s new Diggerland USA adventure park, the country’s first constructed-themed park that allows kids and their families to operate real construction equipment in a safe environment. Spellcaster chose an Ashly Audio ne24.24M modular Protea matrix processor, outfitted with twelve inputs and twelve outputs, to provide all of the equalization, delay, ducking and routing, along with seven Ashly KLR-3200 amplifiers to power the park's 70-plus Community loudspeakers. Ashly's networked neWR-5 wall-mount user control allows staff members to adjust input and volume within a given zone, and Ashly's iPad app gives management complete control of the park’s audio from anywhere via Wi-Fi. Digital signal processing solutions from Symetrix helped Excel AV Group achieve its largest DSP installation to date at Grand Casino Mille Lacs. The system at the Minnesota entertainment complex features no fewer than 36 inputs and 28 outputs. Flexible and easy-to-use processing was a priority, so Excel AV deployed two Symetrix SymNet Radius 12x8 DSPs. “The SymNet Radius units are so powerful and with their Dante capability, the networking is just amazing,” said Crow. The final Symetrix installation—comprising two Radius 12x8 DSPs along with one Axiomtek GOT-5152T-830-J touch panel controller, one xIn 12 input expander and two xOut 12 output expanders—allows staff to effortlessly combine and un-combine ballroom sound. AT&T selected Holosonics’ Audio Spotlight ultra-directional speaker technology for its flagship Chicago store, executing its most ambitious and captivating in-store marketing initiative to date. Incorporating a fleet of Audio Spotlight directional speakers scattered throughout the 10,000 square foot retail space, the client was able to provide discrete, interactive and sonically engaging shopping experiences around every turn. Products came to life as shoppers could not only touch fully functional devices, but also hear, quite literally, what each has to offer and how they will fit with and streamline their lifestyles. Thanks to the Audio Spotlight speakers, every few steps a completely new and informative experience awaited the customer, all without sonically disturbing the areas outside of each display, or other shoppers throughout the store. Holosonics’ Audio Spotlight speakers are a technology unlike any other; their thin, flat speaker panels produce a narrow beam of sound, much like the light beam from a flashlight. Sound levels drop by over 90 percent a single step outside the coverage area, allowing audio to be included in venues and applications where it was otherwise generally difficult, impossible or prohibited. Holosonics’ latest Audio Spotlight models offer a self-contained, fully-integrated package including on-board amplification, microSD playback capability, IR remote control, and flexible mounting options. The Judiciary of Colorado integrated Biamp Systems Audia and Nexia digital signal processing (DSP) platforms to provide distributed audio across the state’s courtroom facilities. Installed within the Ralph L. Carr Judicial Center and more than 100 courtrooms throughout the state, the professional audio solutions improve the intelligibility of in-court proceedings while enabling new capabilities for networked audio technology. Denver’s $258-million Ralph L. Carr Judicial Center is the headquarters of Colorado's court system, housing both Colorado’s Supreme Court and the Colorado Court of Appeals. To bring distributed audio across the facility’s courtrooms, training centers, and conferencing applications, integrator LVW Electronics selected Biamp AudiaFLEX DSP processors — allowing AV managers to fine-tune the solution to satisfy diverse acoustic settings, input/output requirements, or virtual telephony applications. Across the state’s heritage courtrooms, Biamp’s Nexia professional audio system allows staff to control the entire statewide installation remotely, while adjusting sound properties to compensate for unique architectural properties throughout the various locations. Ideal for everyday audio requirements, Biamp’s AudiaFLEX audio platform allows customers to select any configuration of input (IP-2) and output (OP-2e) pairs, enabling multi-channel audio that is seamlessly distributed among multiple units via CobraNet and economical Cat-5 cable. Designed for speaker processing applications requiring line inputs feeding a larger number of discrete outputs, Biamp’s Nexia signal processors include a broad selection of audio components, routing options, and signal processing technology, such as Biamp’s Sona AEC technology to ensure crisp, clear audio. In Manhattan’s highly dynamic—but highly competitive—entertainment market, attracting top artists can make or break a venue. The Hammerstein Ballroom at The Manhattan Center opened in 1906 as an Opera House, and over the last century, has hosted vaudeville, concerts and various special events. In 2012, during a two-year renovation, the decision was made to install, rather than rent, a new sound system to become more competitive in a crowded market. With a large proscenium arch situated 40 to 50 feet upstage of the sound system, and a moveable stage that can be constructed in multiple formats, the Hammerstein needed a flexible sound system. A key factor in the decision-making process was the ability to steer output, directing sound where needed with a high degree of accuracy. Several major brands were evaluated. “Rider friendliness and support, how easy it is to get replacement parts, how robust it is—we thought about all those things and L-Acoustics came up with high marks,” noted Peter Auslan, production manager for the Manhattan Center. In addition, L-Acoustics’ K2 with Panflex has the ability to differentially control horizontal coverage for different parts of the array with the same box—and consequently avoid the proscenium—a factor integral to achieving optimized coverage. “The K2 emerged as the all-out winner,” concludes Auslan. 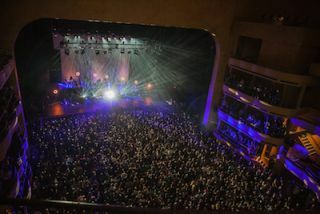 New York’s See Factor completed the installation in September 2014, with the new audio infrastructure making the venue eminently more functional for all manner of applications. With a reputation for world-class undergraduate and graduate programs in business, engineering and science, the Heriot-Watt University was an early adopter of web technologies to enhance classroom learning and to extend the reach of its programs beyond campus limits to even across international borders. Today, Heriot-Watt University boasts one of the worlds largest distance-learning MBA programs offered through its Edinburgh Business School. The university needed a cost-effective, efficient way to bridge the burgeoning gap between the capabilities of its existing videoconferencing solution and evolving needs of a globally dispersed student body. To accomplish this, it installed a Vaddio ClearVIEW HD-USB PTZ Camera, Vaddio EasyUSB Mixer/Amp and Vaddio’s EasyMic MicPODS in its primary meeting room on the Edinburgh campus to create an accessible and easily supported collaboration environment. The Edward Jones Dome in St. Louis features a new Harman Professional audio system, featuring BSS Audio, Crown and JBL VERTEC loudspeakers, and is part of the continuous program to improve the experience of attendees at a variety of events. The Edward Jones Dome project is the largest installation of powered VERTEC equipment in the world. At the heart of it are 12 arrays that each contain 12 JBL VERTEC VT4889A fullsize line array elements with DrivePack DPDA input modules. In addition, there are two arrays of nine and two arrays of 12 JBL VERTEC VT4887A compact line array loudspeakers with DPDA modules that cover the field. Rounding out the installation are 25 Crown amplifiers. The South Amp Room, which powers underdeck and back-of-house loudspeakers is equipped with 10 DriveCore Install (DCi) 4|1250N amplifiers. The North Amp Room, which powers underdeck and back-of-house loudspeakers, as well as an overflow press area, has 11 DCi 4|1250N amplifiers. There are three DCi 2|300N amplifiers in the main control room which power various booth monitors and elevators, and one Crown DCi 4I1250N amplifier, also in the main control room, which is available as an auxiliary amp for various speaker needs on and around the field. NEP, a leading worldwide provider of outsourced services to the broadcast and live event industries, has several recent installations that shed light on the effective use of audio monitoring equipment during the production of top network TV Shows. “There are a myriad of factors that are taken into consideration throughout the design and installation of a TV studio facility, including audio monitoring,” said Stephen Sharp, sr. project engineering manager, West Coast, for NEP. “We are often installing and utilizing audio monitors on a temporary and permanent basis, in a variety of studio facilities that broadcast popular daytime and late-night talk shows. The audio monitors are operated in various locations of the facility, including in the engineering department for monitoring and QC. We also use them in the tape area, for QC and listening while recording. We use them for audio monitoring around other areas of the facility as well. For instance, if we need one for the director, we can put one right in front of him. We use them purely as audio QC, as well as to verify the audio signal is present. United AV Systems, Inc. (United AV) was selected to design and install the audio upgrade for the Volvo Trucks North America New Communication Center in Greensboro, NC. The lobby of the new headquarters for the San Antonio Food Bank was designed to be a gathering space for patrons and a break-out space for meetings. Its expansive design and use of hard surfaces presented an acoustical challenge for the design team charged with transforming the acoustics of the space. On top of this, the team was determined to avoid the use of conventional appearing acoustical absorption materials. Of the four designs available, the Shoji (simple square tube) in stock beige was installed. The six-pound glass wool core and large absorptive surface area (each Lantern is 24-inches (60cm) long and averages 8-inches (20cm) wide) control the reverberant field and provide the attenuation required to make the lobby a useable space. The Montreal, Canada-based Le Diplomate Audiovisual helped install a state-of-the-art Community Room at Quebec’s Multisports Centre/Ville de Vaudreuil-Dorion. The audio system required source management and multi-zones for fluid usage and easy management by multiple users. Nearly 50 VXC performance ceiling mounted speakers were installed, along with one Yamaha MTX 3 audio processor with DCP4V45-US wall control, three XP7000 amplifiers, and MG10 mixer. The entire Multisports Centre is a 6,200 square feet multi-function room offering a variety of activities under one roof. A high-quality sports facility, the Centre is a high performance room that will be used for basketball, hockey, ice-skating, etc. It is also used as a youth day camp when students are on school vacation. The characteristics of the Community Room with its suspended low ceiling required a perfectly balanced sound dispersion. Since the room’s purpose is multifunctional, it was not just a basic paging system that was required but also a high quality sound system. Le Diplomate determined that the Yamaha Commercial Installation Solutions (CIS) Series would be exactly what the room required. The conical 110-degree opening of the Yamaha VXC6W speaker and its integrated back box was perfectly designed to offer the customer a unique, desired sound quality. The ability of the 60w (70v) speakers ideally meets the needs for music and sound animation, while keeping the high intelligibility for simple voice messages. A recent renovation restored Union Depot in St. Paul, Minnesota to its original 1920s splendor while a new sound system with Community ENTASYS loudspeakers provides clear and intelligible voice paging for the depot’s transit services and high-quality sound reinforcement for its frequent concerts, art shows and other public events. To overcome acoustic challenges presented by the building’s beautiful interior, finished in brick, plaster, marble and terrazzo, system designer Joe Wetternach of HGA Architects and Engineers chose a distributed design based on Community ENTASYS column line arrays. He double-stacked the ENTASYS loudspeakers at the “people space” height resulting in even coverage within ±3dB while keeping sound out of the high arched ceilings and minimizing reverberation. Community custom painted the ENTASYS loudspeakers to blend with the depot’s interior. The ENTASYS loudspeakers were supplemented by Community CLOUD4 ceiling loudspeakers in low-ceiling areas and I/O-5 surface-mount loudspeakers in outdoor areas. At the East Kentucky Power Cooperative (EKPC), owned by 16 electric distribution co-ops located in central and eastern Kentucky that are regularly involved in monthly decision-making meetings, comprised of 45 or more participants, the company needed a better audio solution for its AV configuration. Key leaders struggled to hear vital updates and opinions, while side conversations created excess noise picked up by the microphone system. To help alleviate the issues, EKPC partnered with dBA Acoustics, consulting and design services, to create a new conferencing environment that would offer audio clarity through an intelligent wireless solution. With a layout featuring a large u-shaped table, when designing the new conferencing system, it was crucial to have at least one gooseneck base transmitter per two board members. A solution that could be turned on and off by individual members was also requested to limit interruptions and prevent excess ambient noise from drowning out the speaker. To address these requirements Shure Microflex Wireless Systems were selected for its sleek and modern design, lifelike sound, and networked controls. MXW8 Gooseneck Base Transmitters, with a simple push-to-talk feature, were installed for accurate sound reproduction and to remedy the sound delivery issues associated with the limiting ceiling microphones. Each transmitter offers bi-directional wireless capabilities, enabling return channel audio and real-time remote control and monitoring of all settings. This functionality enables the EKPC team to always have access to transmitter battery status for long meetings or back-to-back sessions. Beyond serving a variety of house-blended specialty burgers and drinks, the burger bar Cold Beers & Cheeseburgers is known for having plenty of televisions constantly tuned to sports coverage, including games on DirectTV's NFL Sunday Ticket. The franchise is growing rapidly, with two locations opened, two more on the way, and a food truck. Scottsdale-based integration firm, Clean Media is behind the AV in the storefront locations. Clean Media’s reputation for implementing advanced AV and control systems in area restaurants and sports bars caught the attention of restaurateur, Barrett Rinzler. Rinzler wanted to be able to control the 27 TVs in the new Scottsdale location on the fly easily, while also ensuring superior sound throughout the restaurant and on the outdoor patio. Crestron technology helps to uphold the restaurant’s mission to provide a hometown look and feel, while providing the ultimate in entertainment. Cold Beers and Cheeseburgers’ managers and hosts can focus on serving quality food and drinks, instead of spending time worrying about changing channels or raising and lowering the volume. This was the second Cold Beers and Cheeseburgers location Clean Media has completed. They are currently installing systems at two new locations in Chandler, AZ and Scottsdale, AZ, which will open later this year. Home of the Utah Jazz basketball team, EnergySolutions Arena recently upgraded its sound system, looking for something that could make announcements and music heard clearly above the roar of the crowd anywhere in the venue. They found what they needed in an Electro-Voice system built around XLCi127DVX line arrays. Open since 1991, EnergySolutions Arena includes two main concourse levels and has a total of six public levels including suites, offices, dining rooms, and club levels. The main hall, which has 56 luxury suites and 668 club seats, accommodates audiences of approximately 20,000 for Jazz games and also for concerts and events such as ice shows, rodeos and the circus. The new system was designed collaboratively by audio consultant Larry Lucas of Anthony James Partners (Richmond, VA), Electro-Voice senior technical applications specialist Robert Deyarmond, Dave Larsen of Directlink Marketing (West Jordan, UT), and two in-house personnel: arena AV engineer Jeremy Potter and technical services manager James Baity. The loudspeaker systems throughout are powered by Electro-Voice amplifiers. The EVIDs use CPS 8.5 amplifiers with RCM-810 cards. “Using CPS8.5s allows us to have almost 48 zones of 500 watts in a minimal amount of real-estate,” Potter said. The arrays, meanwhile, use 60 TG7 power amps with RCM-28 cards. Both models of add-in cards work with a set of six NetMax N8000 digital matrix systems to enable IRIS-Net capabilities throughout the facility and also digital audio distribution using Audinate’s Dante protocol. The delays are powered by 12 Electro-Voice P3000RL amplifiers that are still going strong from the previous system. The Newport Performing Arts Center (PAC) in Oregon has recently installed a Meyer Sound Constellation acoustic system. At the core of Newport’s Constellation system is the D-Mitri digital audio platform, 18 miniature condenser microphones and more than 80 loudspeakers. When needed, a Meyer Sound reinforcement system is available. George Relles Sound was system designer and installer; Russ Altermatt was acoustical consultant. The school auditorium at Bingham High in South Jordon, UT underwent a substantial upgrade to its SR capabilities, utilizing Digital Hybrid Wireless microphone and Aspen audio processing technologies from Lectrosonics. Salt Lake City -based BNA Consulting did the design, with integrator Performance Audio, resulting in a system that facilitates control via an Apple iPad. “The Auditorium seats around 2,000 people, for everything from school musicals to public events,” explains Jaimie Verhaal of BNA. “We needed a system that could be used with a digital mixing console for larger events, yet function in unattended mode when the auditorium is rented. Verhaal installed a 12-channel system comprised of two Lectrosonics Venue wireless microphone receiver mainframes, each fully stocked with VRS receiver modules, and eight Lectrosonics LMa Digital Hybrid Wireless beltpack transmitters plus four handheld microphones. The Emmanuel Baptist Church turned to Springfield, Missouri integrator, Paragon 360, for an upgraded audio system featuring Harman’s Crown, BSS Audio and JBL components to meet the needs of its contemporary worship environment. Kansas State University officials recently decided it was time to upgrade the sound and video systems at the Fred Bramlage Coliseum, commonly referred to by students and alumni as the “Octagon Of Doom.” They hired system design company Wrightson, Johnson, Haddon & Williams (WJHW) to specify a new scoreboard and design a new sound reinforcement system that features EAW QX Series loudspeakers. Promedia UltraSound, located in Martinez, California handled the installation. The existing sound system was an old, large-format, horn-based, scoreboard cluster. Because the new scoreboard was considerably larger, there was less space for the new audio system. Ultimately, System Designer Mark Graham opted to place eight symmetrically spaced clusters of QX500 Series loudspeakers around the perimeter of the scoreboard to provide the sound quality and impact the venue required. Each cluster consists of two QX596i and one QX564i loudspeakers. EAW’s QX500 Series offers five different coverage patterns in identical trapezoidal enclosures loaded with an efficient co-axial mid-high device on a central constant directivity horn. The flagship performance venue of the Harold & Dorothy Steward Center for Jazz, ‘Ferring Jazz Bistro’ recently received a full makeover, which includes the installation of a new VUE Audiotechnik sound system specified by sound designer Sam Berkow of SIA Acoustics, whom also executed the complete sound design including room acoustics and sound system configuration. The St. Louis based venue has been a local jazz ‘speakeasy’ for decades, and Berkow installed along with contractor Signal Systems, a purpose-built sound system into the space. The Jazz Bistro space was expanded from 150 to 220 seats, with a lounge for additional seating for 75. In order to create a sound system design that could provide a consistent level with smooth coverage for the uniquely purposed 2-level venue, Berkow chose VUE’s ultra premium h-Class systems. The h-12N is a high definition full range loudspeaker system, which features a 4-inch neodymium HF Truextent beryllium diaphragm for high frequency clarity and output. The system incorporates 2800 watts of internal amplification, and like all h-Class two-way and subwoofer cabinets, they include highly optimized DSP under the watchful eye of SystemVUE, an ethernet based network control and monitoring system. For bass reinforcement Berkow reached for two VUE hs-20, dual 10-inch ACM Active Compliance Management subwoofers, which incorporate 1,000 watts of power, with separate DSP optimized signals, for each woofer. Eight additional h-8 compact loudspeakers were employed as under balcony and balcony fill cabinets. The h-8’s are two-way, 1,600 watt self-powered full range loudspeaker systems with the same Truextent beryllium diaphragm neodymium compression drivers as in VUE’s al-class line array systems. The Carl R. Samuelson and Robert B. Muir pool, part of the Chandler Athletic Center at Williams College, recently upgraded their sound reinforcement system with One Systems loudspeakers. With the effects of time, moisture, and chlorine related byproducts taking their toll on the original sound system—installed in 1988—the school administrators tapped Berkshire Professional Audio to design a new sound reinforcement system. Sonix Pro Audio provided systems integration for the project.Richard Jansen, owner of Berkshire Pro Audio, specified two One Systems 112/NAT loudspeakers to cover the pool area—one to provide focus to the diving area with the other covering the longer portion of the pool. A pair of One Systems 108/NAT loudspeakers, splayed from a center array, covers the entire gallery seating area.“The speakers in the gallery have a different control system than those covering the pool area,” said Jansen. “This allows the school to tailor the levels individually, while a ducking system cuts music when announcements are played.”Both the 112/NAT and 108/NAT are made using highly specialized AL6XN stainless steel in its grilles, screws and U-Brackets. This makes the speakers significantly more resistant to the effects of chloramides.